Dilwale (transl. The big hearted) is a 2015 Indian Hindi-language romantic action film, directed by Rohit Shetty, written by Yunus Sajawal and Sajid-Farhad, and produced by Gauri Khan and Rohit Shetty, under the banners of Red Chillies Entertainment and Rohit Shetty Productions, respectively. The film stars Shah Rukh Khan, Kajol, Varun Dhawan and Kriti Sanon, with Johnny Lever and Varun Sharma in supporting roles.The film released on 18 December 2015. This marks the last film appearance of Vinod Khanna who died on April 27, 2017, shortly after completing the film. 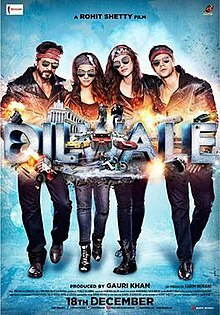 Dilwale has grossed ₹408.15 crore (US$57 million) worldwide,[a] becoming the second highest-grossing film starring Shah Rukh Khan after Chennai Express, also directed by Shetty. Dilwale is also the highest-grossing film starring Shah Rukh Khan in overseas markets. The song "Gerua" also performed well in the charts. While the film's domestic box office performance in India was below expectations, it was an overseas success, the sixth-highest-grossing Indian film overseas. One day in Goa, a boy named Veer Bakshi (Varun Dhawan) meets a passer-by Ishita (Kriti Sanon), a beautiful and educated young girl and befriends her by helping her, injuring his own car in the process. For penance, his older brother, Raj Bakshi (Shah Rukh Khan), makes him fix it during which Veer sleeps and awakes to find that the car’s sound system has been stolen. The men of a local gang leader, King (Boman Irani), try to sell drugs at a crab shack. Veer beats them up after they threaten Ishita. They then come back later to exact revenge on Veer, but Raj breaks up the fight. Raj visits him in hospital and learns King's hideout. He goes there, incapacitates the gang members, and burns their drug stash. Raj tells King’s men that his original name is Kaali. The next day, King stops by Raj’s shop to present a deal where Raj will fix all of King’s cars in exchange for protection. In Bulgaria 2000, Raj accidentally runs over a woman named Meera Malik (Kajol) while a car chase. When he gets out to help her, the rival gang catches up with him, and he has to leave. Next day, Raj reveals that he and Veer are the sons of a businessman, Randhir Bakshi (Vinod Khanna). The next day, after a car crash, Raj is confronted by Meera, who is actually the daughter of the rival gang’s leader, Dev Malik (Kabir Bedi). Meera reveals that she betrayed Raj on Malik's advice though sparing his life. Later, Raj saves Meera from dying, promising to kill if he sees her again. She forgives him and declares her love. They make plans to tell their parents about their relationship. The film flashes back to Goa, where Veer discovers that his friend, Sidhu (Varun Sharma), poisoned his coffee and stole the sound system. Veer is upset, but Sidhu explains it is for his girlfriend, Jenny (Chetna Pande). They agree to help each other secure girlfriends. As a consequence, Veer reveals his feelings to Ishita. Upon finding out about their relationship, Raj wants to meet Ishita’s family. When Raj visits there, he discovers that Ishita is Malik's younger daughter and Meera's younger sister. After talks, Malik agrees to meet Randhir, but secretly, Malik plans to kill Randhir. The meeting breaks into a shootout, during which Malik and Randhir shoot each other. Meera finds Raj with the gun, for which she shoots him; however, he survives the gunshot. Both Meera and Raj decide to move far away from Bulgaria and start a new life. Now in Goa, Veer and Ishita come up with several plots to bring Meera and Raj together. Mani (Johnny Lever) steals King’s car and brings it to the shop, where Veer discovers drugs and burns them. King comes to Meera’s house one night, but Raj (as Kaali) shows up and stops them from causing her any harm. King asks Meera about Kaali which she refuses sparing Raj's life. Meera issues an ultimatum that in order to marry Ishita, Veer must move in with Meera. It is revealed to Veer by Meera that Raj was Randhir's adopted son and is not Veer's older brother. Raghav (Nawab Shah), Malik's right hand, tells Meera that Raj did not kill Malik, but that Randhir had shot Malik in return to his. Upon learning this, Meera apologises and allows Veer that he can take Ishita his home. At Sidhu and Jenny's wedding, King shows up to his stolen car. King starts to cause a disturbance, but Raj beats him up. King then tries to shoot Raj, but accidentally shoots Meera who tried to save Raj. Later, Meera survives and King gets beaten to death. In the end, Raj and Meera reunite in hospital. In January 2015, Rohit Shetty announced a project with Shah Rukh Khan in the lead which would be their second collaboration after the 2013 film Chennai Express. Shetty stated that he would start filming in March 2015. Shetty paired actress Kajol with Khan, making it the seventh time they were cast opposite each other. He also signed actor Varun Dhawan who was reportedly playing Khan's brother while actress Kriti Sanon was signed opposite him. Principal photography began on 20 March 2015 with Dhawan in Goa. Khan and Kajol first joined the crew for filming in Bulgaria from June 2015. Later that month, the first song from the film was shot on Dhawan and Kriti Sanon, in Bulgaria. The schedule there was wrapped up by late July. In August 2015, a romantic song featuring the lead pair was shot in Iceland. The entire team then left for Hyderabad in early September to shoot what was touted to be the final schedule of filming. However, the work in Hyderabad was completed by late October, and filming officially came to an end with a brief schedule in Goa, the same location where it was started. In December, after the promotions had commenced, another song was shot in haste. It featured all four lead actors and had to be played simultaneously with the end-credits. Dilwale was released in the United Arab Emirates a day before its worldwide release on 18 December 2015. The film was released in around 3100 screens in India. The satellite rights of the film were sold to Sony Pictures Networks as part of a deal worth ₹220 crore (US$31 million), along with the next two or three Red Chillies Entertainment productions. The valuation of Dilwale alone was approximately ₹60 crore (US$8.3 million). On 14 December 2015, in the United Kingdom, the film received a 12A classification from the British Board of Film Classification for "moderate violence". The film's UK distributor chose to remove thirteen seconds in order to obtain this rating (the excised material being scenes involving stronger violence than possible for a 12A rating). An uncut 15-rated version is available. Taran Adarsh from Bollywood Hungama gave the film 4/5 stars, saying, "On the whole, Dilwale is akin to a mouthwatering meal that satiates the craving of those who relish masalathons, besides being an absolute treat for SRK-Kajol fans. An unadulterated crowd-pleaser, Dilwale delivers what you expect from a Rohit Shetty film: King-sized entertainment. Go for it!". Komal Nahta in his review of the film said, "Dilwale is a masala entertainer from the start till the end." Rachit Gupta from Filmfare gave it 4/5 stars and added, "Dilwale is the quintessential popcorn flick. It’s colorful, bright and entertaining. It smartly keeps its play on the SRK-Kajol chemistry (watch out for the brilliant ending). It has fantastic music. Decent laughs too. Definitely worth a dekho." Sarita A Tanwar of DNA gave the film 3/5 stars, saying "Dilwale is flawed, but it's right for those who believe that love does conquer it all, actually." Ananya Bhattacharya of India Today also rated the film 3/5 and concluded, "Dilwale is immensely enjoyable despite an oh-my-god-this-is-so-predictable story. Keep your brains out of the picture, and you have an out-and-out entertainer which fits perfectly in the mould of a guilty pleasure. Go indulge!" Shubha Shetty-Saha of Mid Day gave the film 3 stars as well and said, "Watch this for the chemistry between SRK and Kajol which refuses to simmer down even after all these years." Meena Iyer from The Times of India gave the film 3/5 stars, criticizing the plot, and stated, "Dilwale leans heavily on Shah Rukh's mega-stardom, Varun's effervescence, breathtaking locales (Iceland and Bulgaria), orchestrated car chases and over-the-top situations, which have you chuckling." NDTV felt that the film's plot "went in circles" and that while Kajol was great, the film overall failed to appeal. The Economic Times gave the film 2.5/5 stars and felt that it "lacked soul and freshness" and stated that it would only appeal to fans of Khan and Kajol. Rajeev Masand of IBN Live gave the film 2 out of 5 and said, "The real problem with Dilwale is the sheer artificiality of the enterprise. From the rainbow-hued sets and the touched-up landscapes in the Gerua song, to many moments of comedic and emotional payoff, so much of it just feels fake." Namrata Joshi of The Hindu commented, "With Dilwale, Rohit Shetty goes hopelessly wrong despite much that he had at his disposal, including a power-packed cast and producer". Joshi also felt that the attempt to repackage Khan and Kajol had backfired. Rohit Vats of Hindustan Times gave the film a 1.5/5 rating and called the plot "highly predictable". The film, releasing alongside Bajirao Mastani, opened number one at the box office, and collected ₹21 crore (US$2.9 million) nett in India on its opening day, the third highest of the year after Prem Ratan Dhan Payo and Bajrangi Bhaijaan. The film showed little drop on its second day, and earned nearly ₹20 crore (US$2.8 million) nett. On its first Sunday, Dilwale took in approximately ₹23 crore (US$3.2 million) nett, bringing the three-day nett to an estimated ₹64 crore (US$8.9 million). Dilwale had a first week of ₹97 crore (US$13 million) nett in the domestic market. The film earned around ₹21 crore (US$2.9 million) nett in its second weekend. It grossed little over ₹31 crore (US$4.3 million) nett in week two, taking its business to ₹127 crore (US$18 million) nett. The film made around ₹11 crore (US$1.5 million) nett more in the third week. Its final domestic gross was ₹214.15 crore (US$30 million), including a nett of ₹148.72 crore (US$21 million). Khan expressed disappointment with the film's domestic performance in India. Kajol was also reportedly disappointed, with reports claiming that she regretted turning down the lead role in a Sujoy Ghosh film in favour of Dilwale. Dilwale had the highest opening of 2015 abroad and the second highest ever, with a weekend gross of around $8.5 million. The film also set an all-time record opening in the Gulf. In Pakistan, the film earned ₹6.5 crore (US$900,000) in its first three days. The film collected ₹9.13 crore in Pakistan in three weeks. The film went on to earn over $13 million overseas in the first week, again the highest of the year. Dilwale grossed another $3.75 million in the second weekend, for an overall $16.75 million in ten days. After two weeks, the film's earnings abroad were more than $20.5 million. The film had grossed around $23.3 million outside India as of 12 January 2016 to become the highest-grossing film starring Shah Rukh Khan in overseas markets. Dilwale had expanded its business abroad to higher than $25 million following release in new markets like Germany, Netherlands and Indonesia. The film went on to earn approximately $26.6 million (INR 175.65 crore) by February 2016. The film's final overseas gross was US$30.2 million (₹194 crore), the highest ever for a Shah Rukh Khan film, and making it the sixth highest-grossing Indian film overseas. The songs featured in the film as are composed by Pritam and lyrics are written by Amitabh Bhattacharya. Amar Mohile has composed the film score. 'A track titled "Gerua" was released on 18 November 2015 as the first single prior to the soundtrack album's release. The second single to be released was "Manma Emotion Jaage" which was released on 26 November 2015. The second single to be released was "Manma Emotion Jaage". The album features seven tracks and was released on 4 December 2015 by Sony Music India. Sony Music India acquired the music rights of the film for a record ₹19 crore (US$2.6 million). The song "Gerua" also had different versions. An Arabic version called "Telagena" was released on 11 December 2015 while a Malay version entitled "Warna Cinta" featuring vocals from Aliff Aziz and Kilafairy was released later on 18 December 2015. "Janam Janam" (English: Forever Forever) is a Hindi song from the soundtrack of the 2015 Indian film Dilwale. The song is written by Amitabh Bhattacharya, composed by Pritam and sung by Arijit Singh. The music video of the song is picturised upon Shah Rukh Khan and Kajol. It was officially released sometime in 2016. Actor Shah Rukh Khan told a reporter, "Janam Janam" is his favourite song from the Dilwale movie. Urban Asian wrote that "Arijit Singh killed this one with his vocals" while Koimoi noted that Janam Janam was both soulful and heartwarming. The song received extensive coverage as the iconic on-screen Bollywood pair Shah Rukh Khan and Kajol were seen after a long time acting and dancing together in the music video. Indian Express in its coverage of the song wiener wrote "Singer Arijit Singh will take away your breath with his impactful voice, he has put his heart out in this heartwarming love track." ^ a b "DILWALE (12A) (CUT)". British Board of Film Classification. 14 December 2015. Retrieved 14 December 2015. ^ "HIGHEST BUDGET MOVIES ALL TIME". Box Office India. Retrieved 6 May 2017. ^ Rohit Shetty plans to release his SRK-starrer this Christmas Bollywood, News – India Today. Indiatoday.intoday.in (14 January 2015). Retrieved on 13 July 2015. ^ When 'Heropanti' Actress Kriti Sanon Picked Shah Rukh Khan over Akshay Kumar. Ibtimes.co.in (10 February 2015). Retrieved on 13 July 2015. ^ Revealed The cast of Rohit Shetty's next starring Shah Rukh Khan – Daily News & Analysis. Dnaindia.com (30 January 2015). Retrieved on 13 July 2015. ^ Dev, Anindita. (29 January 2015) Shah Rukh, Kajol in Rohit Shetty's next – Zee News. Zeenews.india.com. Retrieved on 13 July 2015. ^ Kriti Sanon to play leading lady with SRK and Varun Dhawan in Rohit Shetty’s next –. Daily.bhaskar.com (3 February 2015). Retrieved on 13 July 2015. ^ Kajol to be the leading lady in Shah Rukh Khan-Rohit Shetty's 'Dilwale' – Daily News & Analysis. Dnaindia.com (17 February 2015). Retrieved on 13 July 2015. ^ "'Dilwale' song 'Gerua' featuring SRK-Kajol becomes an instant hit". 19 November 2015. Retrieved 5 October 2016. ^ a b "Shah Rukh Khan disappointed with his film Dilwale's box office performance". indianexpress.com. Retrieved 28 June 2016. ^ a b c d Hooli, Shekhar (1 May 2017). "Baahubali 2 overseas box office collection: Rajamouli's film beats Chennai Express, Kabali's lifetime record in 1st weekend". International Business Times. ^ "Shah Rukh Khan And Kajol Will Start Shooting In March". Yahoo! Movies. 31 January 2015. Archived from the original on 10 February 2015. ^ Kriti Sanon chooses Shah Rukh Khan over Akshay Kumar – Daily News & Analysis. Dnaindia.com (9 February 2015). Retrieved on 13 July 2015. ^ Baker, Steven. (8 February 2015) Rohit Shetty remains coy over Shah Rukh Khan's next leading actress – Digital Spy. Digitalspy.co.uk. Retrieved on 13 July 2015. ^ Basu, Mohar (20 March 2015). "Varun Dhawan, Kriti Sanon begin shooting for SRK-Kajol starrer 'Dilwale'". The Times of India. Retrieved 21 March 2015. ^ "Rohit Shetty's Dilwale to star Shah Rukh Khan, Kajol, Varun Dhawan and Kriti Sanon". Bollywood Hungama. 14 March 2015. Retrieved 19 March 2015. ^ "Shah Rukh Khan starts shooting for 'Dilwale' in Bulgaria, shares picture with Kajol on Twitter". The Indian Express. 13 June 2015. Retrieved 21 December 2015. ^ "Varun Dhawan, Kriti Sanon shooting 'Dilwale' song in Bulgaria". The Indian Express. 29 June 2015. Retrieved 22 December 2015. ^ "SRK wraps 'Dilwale' shooting in Bulgaria – The Times of India". The Times of India. Retrieved 21 December 2015. ^ "Inside Pics: Shah Rukh Khan, Kajol on Dilwale sets in Iceland : Bollywood, News – India Today". indiatoday.intoday.in. Retrieved 21 December 2015. ^ "'Dilwale' Team Shooting Their Final Schedule In Hyderabad". Koimoi. Retrieved 21 December 2015. ^ "Team Dilwale is Done With Hyderabad. Next Stop, Goa". NDTVMovies.com. Retrieved 21 December 2015. ^ "SRK, Kajol, Varun and Kriti shoot for 'Dilwale' song". mid-day. Retrieved 22 December 2015. ^ "Dilwale First Day Territorial Breakdown – Box Office India". boxofficeindia.com. Retrieved 20 December 2015. ^ a b "TV rights of SRK's 'Dilwale' sold for Rs 60 crore?". mid-day. Retrieved 22 December 2015. ^ "Dilwale Review – Bollywood Hungama". www.bollywoodhungama.com. Retrieved 20 December 2015. ^ "DILWALE". Komal Nahta's Blog. Retrieved 20 December 2015. ^ "Movie Review: Dilwale". filmfare.com. Retrieved 20 December 2015. ^ "'Dilwale' review: Flawed movie survives because of Shah Rukh Khan and Kajol". Daily News & Analysis. Retrieved 21 December 2015. ^ "Dilwale movie review: Shah Rukh and Kajol's old wine in old bottle is intoxicating! : Reviews, News – India Today". indiatoday.intoday.in. Retrieved 21 December 2015. ^ "'Dilwale' – Movie Review". mid-day. Retrieved 20 December 2015. ^ "Dilwale Movie Review, Trailer, & Show timings at Times of India". The Times of India. Retrieved 20 December 2015. ^ "Dilwale Movie Review – NDTV Movies". 21 December 2015. Archived from the original on 21 December 2015. Retrieved 21 December 2015. ^ "'Dilwale' review: The film lacks soul and freshness". The Economic Times. Retrieved 21 December 2015. ^ "'Dilwale' review: Real problem with the film is sheer artificiality of the enterprise". IBNLive. Retrieved 22 December 2015. ^ "Dilwale: Heart attack". The Hindu. 18 December 2015. ISSN 0971-751X. Retrieved 21 December 2015. ^ "Dilwale review: Cars topple, dons fly, Shetty laughs, viewers cry". Hindustan Times. Retrieved 21 December 2015. ^ "WORLDWIDE Dilwale 150 Crore Bajirao Mastani 90 Crore". boxofficeindia.com. Retrieved 23 December 2015. ^ a b "Bollywood 200 Crore Club Movies: Hindi Films". Bollywood Movie Review. 3 April 2017. Retrieved 1 October 2017. ^ a b "Exchange Rates (64.2 INR per USD)". The World Factbook. Central Intelligence Agency. 2015. ^ "Dilwale Vs Bajirao: It's Rs 21cr for SRK, only Rs 12cr for Ranveer". Hindustan Times. Retrieved 22 December 2015. ^ "Dilwale box office collection: SRK-Kajol film crosses Rs 40-crore mark on Saturday". International Business Times, India Edition. Retrieved 21 December 2015. ^ "Dilwale And Bajirao Mastani Weekend Estimates". Box Office India. 21 December 2015. ^ "Dilwale Has Good First Week – Box Office India". boxofficeindia.com. Retrieved 25 December 2015. ^ "Dilwale Second Saturday Business – Box Office India". boxofficeindia.com. Retrieved 28 December 2015. ^ "Dilwale At 127 Crore In Two Weeks". boxofficeindia.com. Retrieved 1 January 2016. ^ "Business Comes Down For Christmas Releases After Holiday Period – Box Office India". www.boxofficeindia.com. Retrieved 8 January 2016. ^ a b "Box Office: Worldwide Collections of Dilwale". Retrieved 31 October 2016. ^ "Dilwale: After Shah Rukh Khan, Kajol is disappointed with the film's box office performance". indiatoday.in. Retrieved 28 June 2016. ^ "Kajol and Varun Dhawan regret being a part of 'Dilwale'?". timesofindia.com. Retrieved 28 June 2016. ^ "Dilwale Top In Overseas 2015 – All Time Record In Gulf". Box Office India. 21 December 2015. ^ "Dilwale performing better than Bajirao Mastani at Pakistani box office". The Indian Express. 23 December 2015. Retrieved 23 December 2015. ^ "Dilwale Is Huge In Overseas Markets – Box Office India". boxofficeindia.com. Retrieved 25 December 2015. ^ "Dilwale Heads For 20 Million Plus In Overseas – Box Office India". boxofficeindia.com. Retrieved 28 December 2015. ^ "Dilwale Crosses 20 Million In Overseas Markets – Box Office India". boxofficeindia.com. Retrieved 2 January 2016. ^ "Top Ten Shahrukh Khan Grossers In Overseas – Dilwale Number One". boxofficeindia.com. Retrieved 13 January 2016. ^ "Dilwale v/s Bajirao Mastani: Who won the final round of the worldwide box office battle?". Daily News & Analysis. Retrieved 16 January 2016. ^ "Overseas Top Ten 2015 – Xmas Releases Give $40 Million". boxofficeindia.com. Retrieved 19 January 2016. ^ "Dilwale Overseas Collections And Records". boxofficeindia.com. Retrieved 13 January 2016. ^ "Dilwale Complete Overseas Collections". ^ "Dilwale v Bajirao Mastani Worldwide Comparison – Box Office India". www.boxofficeindia.com. Retrieved 18 February 2016. ^ "link". Bollywoodhungama.com. Retrieved 14 February 2016. ^ "link". indiawest.com. Retrieved 14 February 2016. ^ "link". timesofindia.indiatimes.com. Retrieved 14 February 2016. ^ "link". bollywoodlife.com. Retrieved 14 February 2016. ^ "Watch Dilwale first song: Shah Rukh Khan romances Kajol in Gerua". ^ "Dilwale first song released: Filled with SRK-Kajol's magic and sizzling chemistry". ^ "Watch: Dilwale's Second Song 'Manma Emotions Jaage' Is Out And It's Awesome". ^ "'Dilwale' songs up for pre-orders exclusively on iTunes; Shah Rukh Khan joins Apple Music Connect". ^ "Telagena (Gerua – Arabic Version) [From "Dilwale"] – Single by Adel Ebrahim, Pritam & Antara Mitra on iTunes". iTunes. Retrieved 21 January 2016. ^ "Warna Cinta (Gerua – Malay Version) [From "Dilwale"] – Single by Pritam, Aliff Aziz & Kilafairy on iTunes". iTunes. Retrieved 21 January 2016. ^ han-kajol-rohitb-shetty/1/538343.html "Janam Janam is my favourite song says Shahrukh Khan" Check |url= value (help). Retrieved 17 June 2017. ^ "music review dilwale". Retrieved 27 March 2017. ^ "Watch:Shahrukh Khan and Kajols soulful Janam Janam in Dilwale". Retrieved 16 June 2017. ^ "17 moments from dilwale that make you drool over sharukh Khan and Kajol". Retrieved 16 June 2017. ^ India.com Entertainment Desk (4 December 2015). "Dilwale music review: Arijit Singh shines in this Shah Rukh Khan-Kajol movie album". India.com. Retrieved 6 June 2017. ^ "Janam Janam is my favourite song". Retrieved 23 August 2017. ^ "Shahrukh Khan Kajol multiply love and romance in Janam Janam song from dilwale". Retrieved 7 July 2017.